The National Forum facilitated a sectoral focus, called an enhancement theme, on ‘Assessment of/for/as Learning’ in 2016-2018. The enhancement theme helped to focus expertise and attention on assessment and feedback, an issue of real interest and importance to teaching and learning in Irish higher education. The ultimate aim of the enhancement theme was to ensure that Ireland adopts and promotes innovative, engaging, collaborative, learner-oriented and integrated approaches to assessment that take account of the complex dynamics and requirements of higher education. Through the gathering of evidence, the building of capacity and the sharing of good practice, much progress was made. This included the publication of a profile of assessment practices in Irish higher education, the publication of agreed definitions and principles underpinning assessment in Irish higher education, and the compilation of resources to support programmatic approaches to assessment in higher education. Experts from across the sector came together to reach consensus on definitions and purposes of assessment. Giving some focused guidance for assessment and feedback in Irish higher education. Recognising the benefits of adopting a programme-level approach to assessment and feedback. Please refer to the National Forum Insight ‘Expanding our Understanding of Assessment and Feedback in Irish Higher Education’, March 2017 available here. Principles are a useful way of operationalising and sharing good practice in assessment. There are some common, more obvious, principles. For example, assessment should be valid, reliable and effective. The following principles also emerged from the Assessment Enhancement Theme, to give some focused guidance for assessment and feedback in Irish higher education. We usually think of assessment as a lecturer (teacher) giving students a task so that the lecturer can judge the student’s work. This is a very common and important purpose of assessment (Assessment OF Learning), but not the only one. If assessment is a form of judgement, then giving students feedback and/or discussing their work so that they can judge their work based on this information is also an important purpose of assessment (Assessment FOR Learning). However, another vital purpose of assessment is doing tasks that allow students to critically evaluate their own work, to be able to monitor themselves. Where students make changes and consider actions to their work, based on this activity, they are now ‘self-regulating’ their work. These self-monitoring and self-regulating activities can be termed Assessment AS Learning. Assessment AS Learning may need to be given more emphasis if we are to empower students in assessment. 2. Assessment and feedback should be clear and understandable by staff and students. There are two aspects to this assessment and feedback principle. The first aspect is that the language around the purposes of assessment needs to be understandable for both staff and students, i.e. 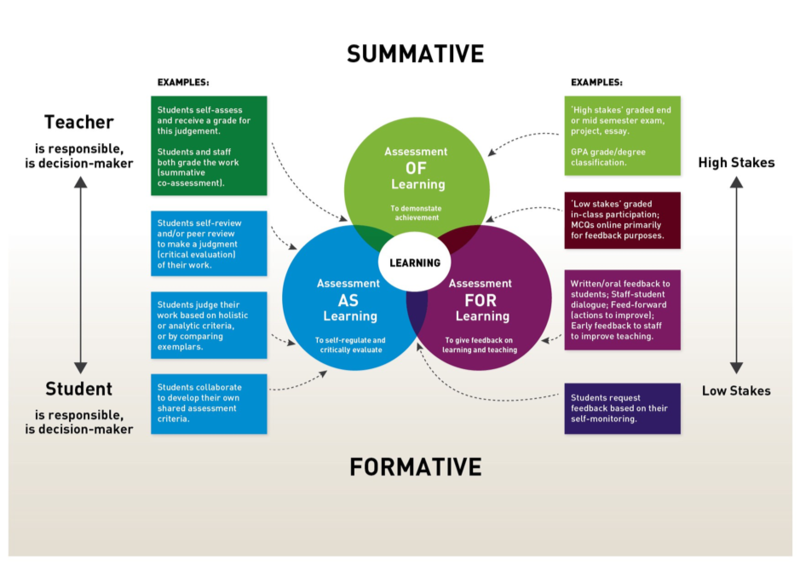 summative and formative assessment; assessment of, for and as learning. Secondly, at the point of time where students receive an assessment task, they need to be clear on the expectations around that specific assessment. The first is wider and applies to all assessment contexts, whereas the second aspect is specific to the assessment within a student’s module. Taking a Programme Approach to Assessment and Feedback. the design and positioning of assessment and feedback within a programme is key to the integration of learning from different modules in ways that prepare students to apply their learning successfully within their lives and work. 4. Assessment and feedback approaches should foster partnership between staff and students. Students have an important role to play in becoming more empowered in their own assessment and feedback processes. Fostering this partnership is an important assessment principle. facilitate students’ involvement in assessment-related institutional committees. partner with students to negotiate their assessment methods and/or timing, where possible. give students some choice of the methods used to assess them from a prescribed range (e.g., oral or poster presentation). give students some choice of questions on an examination paper/assignment. 5. Students should experience a diverse range of assessment methods, including, where relevant, authentic and work-based assessments. There is a need for more diverse and at times more authentic assessment in Irish higher education. This is in response to the ever-changing cohort of students (including, for example, international students, mature students, part-time students, students with disabilities) and the need to assess a wider spectrum of graduate attributes for today’s society (CAST, 2011; DES, 2016). There is however an overemphasis on the examination as an assessment approach. In 2016, 61% of 487 modules in a profile of Irish assessment practices contained examinations (National Forum, 2016). The examination, in particular, is perceived as not relating to how learners will engage with assessment in the workplace or in their lives more broadly. There are patterns of other common assessment methods in some fields of study, such as projects in Health and Welfare (see figure below). There is also a need for a diversity of feedback approaches and a need, in particular, to develop students’ involvement in feedback approaches (O’Neill, 2015). Supporting the development of more diversity of assessment and feedback approaches is important for the enhancement of teaching an learning. Work experiences in a programme are linked with the idea of developing authentic knowledge and skills for life beyond higher education. In programmes with work placements, there is an need for appropriate work-based assessment of, for and as learning opportunities. Explore the extent to which your programme’s outcomes are being assessed through an appropriate level of diversity. Introduce diversity sequentially throughout the programme to build students’ familiarity with different assessment methods. Authentic assessment is described as student-structured; highly applied to context; has strong connection to discipline; supports complex learning; encourages student engagement; supports motivation and learning. Authentic assessment can be judged based on the degree to which it: involves performing a task and is set in ‘real life’ (Mueller, 2006). Developing some choice in assessment approaches in a module can allow for diversity that gives some control to students (O’Neill, 2017). The assessment load for students should be manageable. Too much assessment can lead, at times, to a lack of deeper engagement in the subject. In addition, in a modular system it can lead to poor class attendance as students prioritise their assessment time in one module over over class time in another module. This has been described as an ‘assessment arms race’ (Harland et al, 2015). Judging overload is challenging as students’ experience of assessment load differs and different assessments have different weightings and different time expectations (Fielding, 2008; Galvez-Bravo, 2016; Jonkman et al 2006). Therefore, although number of assessment is not a very accurate measure it does give us some indicator of load. Similarly, the staff time allocated to assessment design and corrections should be manageable. Feedback approaches should be an efficient use of staff time. Reduce assessment load or size, where appropriate. Prioritise feedback earlier in the module. Ask students to identify what feedback they would like to get and focus your time on this. Replace some staff feedback with in-class students self-monitoring activities. Consider the impact of small modules in your programme. 7. Assessment and feedback should be enhanced through staff engaging in related professional development, including engagement in scholarship in this area. The new Irish Professional Development Framework for All Staff who Teach in in Higher Education supports the idea of staff engaging in professional developed (PD) and scholarship in the area of assessment and feedback. Staff and students need to be supported to develop their assessment literacy. Professional development opportunities should support the development of individual staff and teams of staff to enhance assessment practice and policies. In line with the new National Professional Development Framework, opportunities should include non-accredited PD opportunities (including collaborative, unstructured and structured) and those which are accredited. Professional development should support ‘new learning’, ‘consolidating learning’, ‘mentoring’ and ‘leading’, related to Assessment OF, FOR and AS Learning. The European Standards and Guidelines for Quality Assurance in the European Higher Education Area (ESG) emphasises that institutions should ensure that programmes are delivered in a way that encourages students in an active role(European Commission, 2015). The HEA working group report, in particular, maintains that students as partnersis key in moving beyond legal compliance to embed a culture of engagement throughout the institution (HEA, 2016). It also notes that institutions should embrace innovative learning techniques which incorporate the student as creator of their own learning. Whereas many policies highlight the importance of timely feedback to students(European Commission, 2015; QQI, 2016), there is also a recognition that students have a part to play in developing their own judgements (Assessment AS Learning): to encourage a sense of autonomy in the learner (QQI, 2016); and to empower students in the learning process, e. the principles of universal design for learning (HEA, 2015). As highlighted by the data from the Irish Student Survey of Engagement (ISSE), students gain most when they invest time and energy in their learning and institutions and staff have key roles to play in providing an environment that both encourages and facilitates that engagement (ISSE, 2016).